Yellowstone National Park is a bucket list destination for many, and rightfully so—one of America’s most celebrated national parks, the vast terrain boasts natural wonders like geothermal features, along with wildlife spotting opportunities that make any visit an adventure to remember. While epic sights like Old Faithful and the edges of the Grand Prismatic Hot Spring round out travelers’ must-see lists, a handful lesser known stops are sights worth seeing. “90 percent of people who come to Yellowstone only see 10 percent of the park,” Dawson Smith says. “They come mostly for the highlights. However, with about 10,000 individual features in the park, there are many spectacular geysers, hot springs and mud pots that most people don’t know about.” Smith, the lead naturalist at Spring Creek Ranch in nearby Jackson Hole, WY, shared his five favorite spots that are still under the radar and sure to make you the trendsetter among your friends. Looking for a spot to explore sans crowds? This backcountry geyser basin may be it. “While viewing the features such as Gourd Spring, Minute Man Geyser, and Taurus Geyser, you’ll probably be the only one there,” Smith notes. This beautiful basin lies on the West end of Shoshone Lake, which has the distinction of being the largest lake in the Lower 48 not accessible by car. Get there via an 8.5 mile hike from Lone Star Geyser, another lesser known geothermal feature that’s about a mile east of Old Faithful. This remote spring (which flows into the Ferris Fork River) is in the Bechler Region, a remote area in the Southwestern part of Yellowstone Park. To find it, begin at Cave Falls Road (this road starts 26 miles from Ashton, Idaho) and follow to the Bechler Ranger Station. From there, take a 13-mile hike to reservation-only camping near the river and spring. “Although it’s not safe to swim in Mr. Bubbles, you can dip into the Ferris Fork near where the hot spring water flows into the river, which making for a relaxing backcountry soak and unforgettable experience,” Smith says. Adventurers take note: You’ll want to stash some bear spray in a sturdy daypack or lightweight duffel for this one, as you’ll be trekking through bear country. These bright and vibrant hot springs make for snapshots that’ll wow, even if you’re just carrying your smartphone in a small waistpack of essentials. “Often overlooked, find these colorful hot springs in this small geyser basin; arguably the most incredible blue color is found in opalescent pool,” Smith promises. “Black Sand Basin is easy to access with a parking area just off of Lower Loop Road, a quarter of a mile from the Old Faithful off-ramp. You’ll get a lot of ‘bang for your buck’ at this basin!" 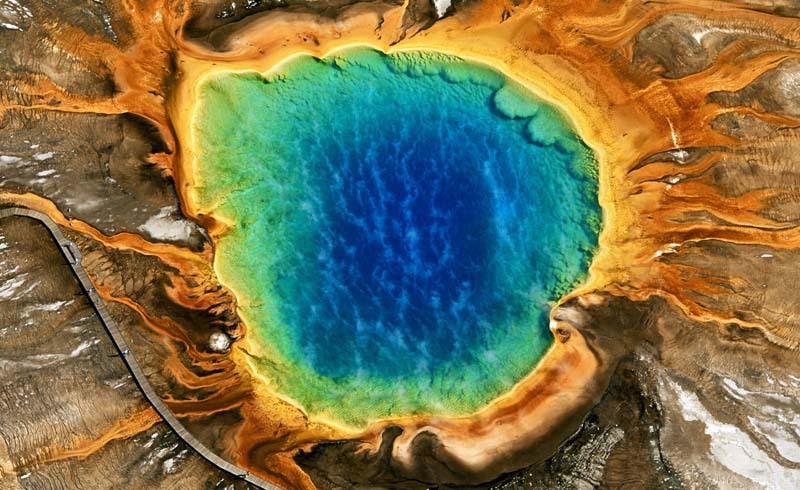 Yellowstone’s picturesque Grand Prismatic Hot Spring is the park’s largest and one of the park’s most beautiful. While most pencil in a stop on their itinerary, Smith says that far fewer people seek out a view beyond the hot spring’s edges. “The best way to see the colors and shades of blue refracted from the large pool and colorful bacteria mats on the margins is to take a short hike along the Ferry Falls trail,” he notes. 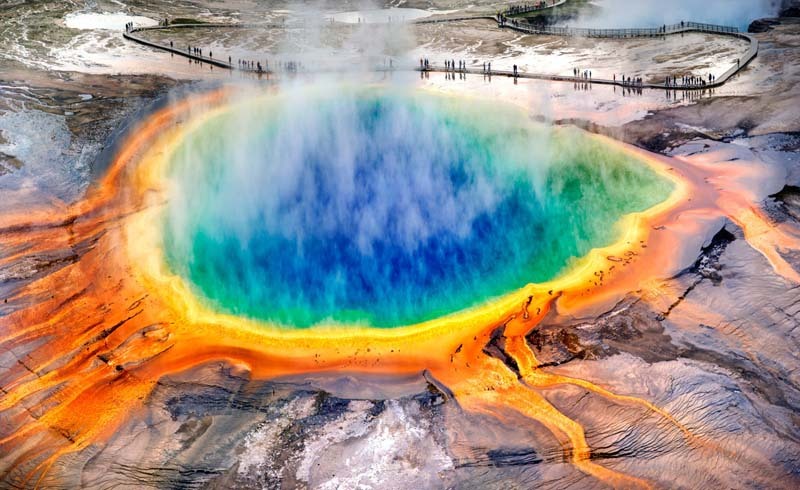 “You’ll reach an elevated outlook about 400 yards from the pool and 250 yards up above; the view is a truly ‘wow’ moment.” If you were looking for permission to skip the ultra-crowded boardwalks around Grand Prismatic, consider this it.